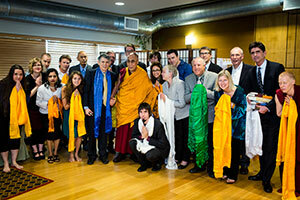 His Holiness the Dalai Lama visited FPMT International Office on May 10, 2013. 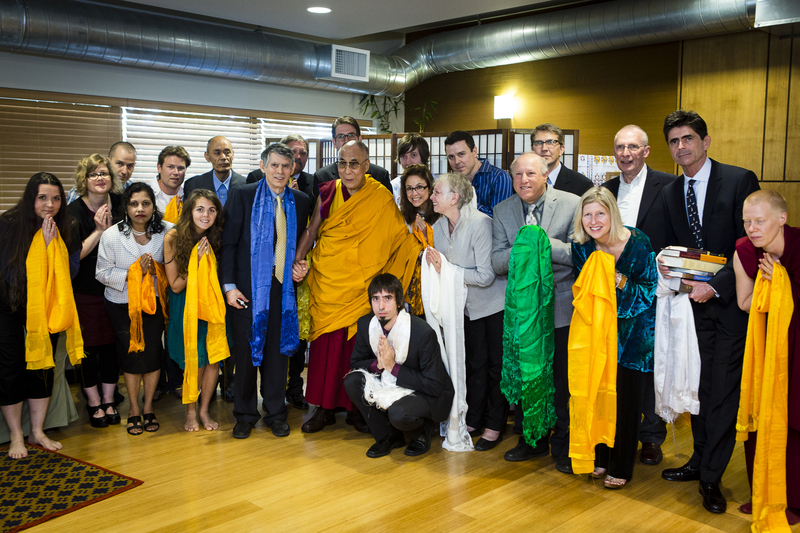 His Holiness was photographed with International Office staff and FPMT, Inc. board members. Work a Day for Rinpoche on Saka Dawa! 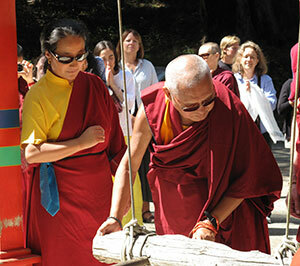 Lama Zopa Rinpoche during the long life puja offered by the senior monks and nuns of Kopan, Nepal, April 2013. Please see the latest advice on practices we can all offer for Lama Zopa Rinpoche’s good health and long life. Following that advice, the senior monks and nuns of Kopan Monastery and Nunnery, out of concern for Rinpoche’s health and in support of all the practices requested, offered Rinpoche a long life puja on April 29. Thanks to all at Kopan and everyone else who is already doing these practices! Lama Tsongkhapa mentioned that all the suffering in the world comes from ignorance; therefore, the root of suffering is not outside. No matter how much scientific knowledge and education worldly people have, they still believe the cause of suffering to be outside; but that’s wrong. The cause of suffering is in the mind and that’s why it is the mind that has to change. Changing the mind is more important than trying to change what’s outside; changing outside never finishes. Change has to come from the mind. It has to come from your mind. Lama Zopa Rinpoche and Khadro-la having tea after the long life puja, Kopan Monastery, Nepal, April 2013. The hell, hungry ghost and animal realms come from your mind, from your negative, impure mind and wrong way of thinking every moment and every day. Enlightenment, the fully awakened omniscient mind, liberation from samsara, and day-to-day happiness come from your mind and from the correct way of thinking, from positive thoughts. This is how everything comes from the mind. For example, when you have problems in daily life, if you practice patience, compassion, thought transformation, bodhichitta, emptiness and so on, then at that time there are no more problems. In that hour and that minute when you change your mind and think differently, the problems are gone. But when you don’t change your mind and keep thinking the old way, as people in the world generally do, believing that the root of suffering is outside even though they have so much scientific knowledge, well then, the suffering never finishes. There is no end to suffering. Lama Tsongkhapa mentioned that all the sufferings come from ignorance, but this is not just something stated by Lama Tsongkhapa; the more you learn Dharma and check scientifically, the more you discover and realize that this is true. Lama Zopa Rinpoche and Khenrinpoche Geshe Chonyi, Kopan Monastery, Nepal, April 2013. Two videos of Lama Zopa Rinpoche teaching at Himalayan Buddhist Meditation Centre (HBMC), Kathmandu, Nepal on January 11, 2013. Please enjoy both video 1 and video 2. Lama Zopa Rinpoche and Khadro-la work for peace at the Namgyälma bell at Land of Medicine Buddha, California, USA, June 2012. Photo by Ven. Tenzin Sangpo. This Saka Dawa, May 25, we invite you to WORK A DAY FOR RINPOCHE and collect 100 million times the merit! Your donation of a day’s wages, or any other amount, supports FPMT International Office, which means your offering of work benefits the creation of education programs and practice materials; aids all of FPMT’s charitable projects; supports Dharma centers, projects and services; sustains the vast resources on the FPMT website, and more! By Working a Day for Rinpoche you offer light to the lamp of Rinpoche’s vast vision and work. Your contribution any day this month will be dedicated on Saka Dawa. Click here to donate or contact International Office directly to learn more. Also check out the Work a Day Facebook page for daily photos, videos, quotes and stories until Saka Dawa! Long Life Lama Chöpa with Request to the Dakinis eBook – Please note, this is one of the current recommended practices for Lama Zopa Rinpoche’s health. Sixteen Arhats Puja available as eBook as well as booklet in letter and A4 formats. The Yoga of the Three Purifications of Shri Chakrasamvara available as eBook as well as booklet in letter and A4 formats. We have updated a short Medicine Buddha Sadhana. All are available from the FPMT Foundation Store. US$15,720 has been offered to a food fund for 35 students at Ngari Institute in Ladakh, India, covering the entire cost of three meals a day for the whole year for the students and staff. US$100,000 contributed to a new classroom project being built in Sera Je Monastery. US$5,677 was offered to the Tashi Lhunpo Health Care Center, which offers health care to the monks of Tashi Lhunpo Monastery and local Tibetans and Indians in the area. US$22,709 enabled a much needed new roof to be built for Kopan Hostel at Tsawa Khangtsen at Sera Je Monastery. You are welcome to contribute any amount to this fund which supports the compassionate activity of Lama Zopa Rinpoche. Get ready for the next issue of Mandala magazine, coming out in mid-June 2013. We feature Lama Zopa Rinpoche’s recent tour of FPMT centers in Taiwan, Singapore, Malaysia and Hong Kong. Also in this issue, coverage of the visit by His Holiness the Dalai Lama to FPMT International Office and Maitripa College’s His Holiness the Dalai Lama Environmental Summit. To receive Mandala delivered to your home, consider supporting the Friends of FPMT program today. Every year we celebrate our ordained Dharma brothers and sisters on the day marking the First Turning of the Wheel of Dharma, which this year falls on July 12, 2013. Mark your diaries and plan your International Sangha Day event now! Also this is the day for your center, project or service to make its annual donation to the Lama Yeshe Sangha Fund. More information to come via the CPMT e-group soon. The Basic Program materials pages in English, French, and Spanish, have been updated. All English Basic Program materials are now available online. PLEASE NOTE: The Basic Program CD is no longer in use. The materials pages are accessible to centers and teachers offering Basic Program from the FPMT Affiliates Area. The Basic Program and Masters Program web pages have been updated with our most current information. Please link to these pages as part of your Basic Program or Masters Program web presentations. 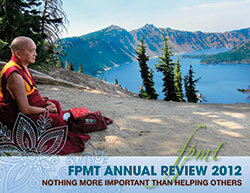 We hope you have received the printed FPMT Annual Review 2012: Nothing More Important Than Helping Others which we mailed to your center, project, service or study group recently. Was the number of copies we sent you sufficient? How do you use the printed annual review? Do you prefer reading the hard copy or the PDF online? Do you have any feedback about the annual review? 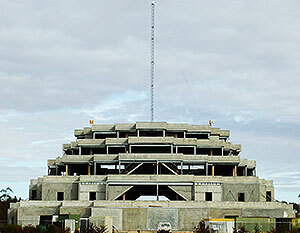 The new light tower erected on the top of the Great Stupa of Universal Compassion in Australia shows the projected finished height of the stupa. The light on top and fairy lights on the guy ropes will be switched on by the representative of Australia’s prime minister at the Festival of Light on May 25. 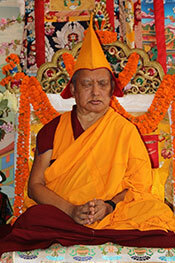 The young incarnation of Ribur Rinpoche will be enthroned at Sera Me Monastic University, India on May 18, 2013.